The pollen grains from a dandelion (Taraxacum sp.) were collected and air-mounted (no liquid mounting medium used). Eleven separate images were stacked together to increase the depth of field and to produce the final image. The color contrast was then adjusted. Dark-field patch stop was used. Interesting golden color. Quite nice against a black background. What magnification was this? And do you think it would have been sharper if it were in a mounting medium (that is, if you had used a 100x oil lens)? Thanks! I don’t quite remember, but I think I used the 10x or 20x objective. >And do you think it would have been sharper if it were in a mounting medium (that is, if you had used a 100x oil lens)? There are 2 different issues here: mounting medium or not and 100x oil immersion. Mounting medium, e.g. water (instead of air): I tried it, but this gives a quite different impression. The color does not appear to be as intense and the pollen look more transparent. Also: the water makes the pollen swell up. 100x oil is suitable for very thin specimens and the pollen is not very thin. Oh my gosh, that was a lot more than I expected. Thank you so much for opening my eyes to so many variables to consider. Youch! Much to consider for a single photograph. I have thought about stacking images, and also stitching them afterwards into a big image. For one “single” image, it’s a lot of work. 🙂 Haha. Anyhow, thank you for the explanation. I have a USB Proscope with 10X, 100X & 200X lens. 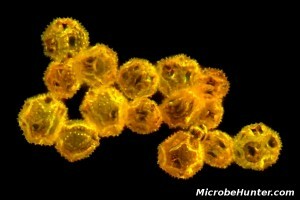 I am interested in examining the pollen from the plants that grow in my area. I will use the camera feature to record each of them for my archives so I will not be collecting the specimens to save on the slide. What do you think is the best method for viewing them-magnification and process? I also raise bees and plan to collect pollen from their hives during the spring and summer and compare it with the plant pollen that I collect to see if I can make matches. a. mounts (no mounting medium, only air). This works fine for low magnifications. b. Mount the pollen in Glycerine Gelatine (according to Kisser, not Kaiser). In this case no fixing in alcohol is needed and the shape of the pollen are preserved. c. Using mounting medium with an organic solvent (like Euparal). This may lead to the dehydration of the pollen, and shrinkage. Be aware, that plant identification based on pollen analysis is a quite complex science. Would you please give me just a few more details on your mounting? Do you still use a coverslip? Do you place pollen in a well on a slide, protected with a coversip? If not, how do you prevent the pollen on the slide from getting blown around? The pollen is first placed on a regular slide (no well, no concave slide) and a cover glass is placed directly on top. This protects the pollen and also makes sure that they are more or less level. The cover glass can then be held in place with thin strips of adhesive tape on the side. You can also try to seal the cover glass with nail polish, but the risk is quite high that some of it will flow beneath the cover glass. Use highly viscous nail polish (allow solvent to evaporate before applying). The slides should then be stored horizontally, but I found the pollen to stick well to the glass anyway. For making pollen slides with a mounting medium, you can use Glycerin Gelatin according to Kisser (not Kaiser). This is a water-based mounting medium which is compatible with the delicate pollen. Thanks much. Using the adhesive tape on the edges of the cover glass won’t crush the pollen? The pollen is so small that crushing them is unlikely. This would be a problem with larger specimens. Small insects would need the support of the surrounding mounting medium. The tape does not really press the cover glass down, the force is not high, it kind of prevents it from being blown off. The tape is also on the side, while the pollen is more in the center. So I would guess that the force is not really directed at the pollen. If you have a look at the picture, you will see that some of the pollen overlap a bit, so there seems to be some space. I would try the following (having not tried it myself): Place a cover glass on top and then use a pencil (etc) to press down on the cover glass while looking through the microscope. If the pollen deforms, then this is an indicator that they are indeed crushed. But I do suppose that most pollen are rather strong anyway. Oliver.